Working cattle ranches – an insight from the inside at Double Rafter Cattle Drive! 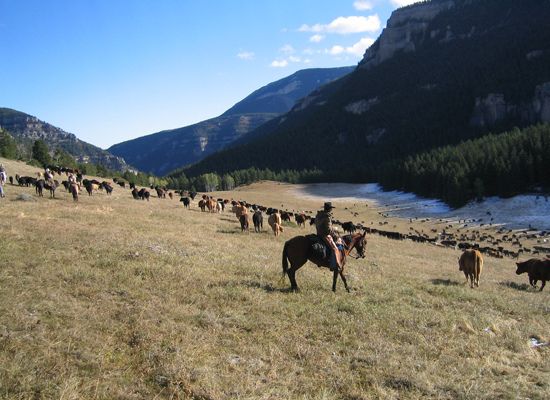 Top50 Ranches gives you an insight as to what it’s like owning and running working cattle ranch, Double Rafter Cattle Drive! What's the most important thing you have that brings guests back year after year? Ours is very simply the authenticity of the trip, the warm hospitality of the family and the fact the horses are ranch horses, not nose-to-tail dude horses. Because we're so real in how we do things, people recognize that what they get for their dollar here is reality - we're a niche market and do not appeal to everyone. Those that we do appeal to have a lot of the same values in life which makes for a great week, as they are all wanting the same high-adventure experience. They expect to be tired, dirty and on a high at the end of the week, doing things they have never experienced before, and that is what they get! Where do you see our industry going in 3 years, 7 years and 20 years? I think in that time frame, what we will see is those at the top all doing something unique in the industry to set them apart - those are the top 10%. The rest are completely interchangeable and will continue to be in and out of the market, but they won't offer something unique. They are drawn by the lure of high dollars, but don't have the ability to grasp what it actually takes to to survive in the long run. Our society is geared to believe that if you don't take time out to enjoy life, you can't possibly be happy, so the continued draw in this industry is that people will spend good money on recreational activities. If you could invest a million dollars into your ranch, where would you put it and why? That's an easy one! I would most definitely expand my base property - with expansion would come the opportunity to offer more experiences to people all over the world. Ranching has been my passion since I learned walk and talk, and I am able to work with all kinds of people. I want to reach out, with what we do, to help others find something inside them that they feel to be missing in their lives. I can't count the number of people who say we have changed their lives! When people see how hard we work and that we are actually enjoying ourselves while doing so, they want some of that same contentment. I feel blessed because everything I have, I have clawed and scratched to earn, and I get real contentment seeing our guests' reactions. Do you have a funny/odd/crazy story or anecdote from a ranch vacationer, or one from your own experience? We had a little red-headed gal from New York who was a real fireball. The first day out with the herd is always the day we are most concerned about peoples' safety and we are very alert, paying attention to every little detail. On that particular trip we had 16 miles to go with the herd, which is a huge day from a cattle trailing point. We had gone about 10 miles and were trailing the cattle up a bare ridge. It had become hot, people were tired, the cattle were tired and there wasn't a lot of conversation going on. The girl dismounted and was leading her horse, which is not uncommon as it helps alleviate some of the soreness. However, she was getting farther and farther behind, and I kept looking back, making sure she was still coming. The horse she was leading, Rose, was stopping every 3 steps and grabbing a mouthful of grass - she would take a couple mouthfuls, then go a few more steps, and stop and graze again. What we didn't know, was that the girl was having a very serious call of nature and was hoping to drop back far enough so that she could maybe have some privacy. As she observed Rose grazing, the thought occurred to her that she could step behind the horse and use her as a blind. Rose had her head down, so the girl dropped the reins, stepped back behind her, dropped her pants and assumed the position. At that point, Rose being a herd animal realized she was a long way back from the herd, threw her head in the air, whinnied and came charging up the bare ridge at a dead run. The sound of charging hooves of course made every wrangler spin around in anticipation of some sort of wreck, only to see this poor girl caught in a very compromising position!